Whether you’re a born and bred local or a weekend warrior, there’s no doubting the coast is booming – especially when it comes to good ol’ fashioned beer drinking. 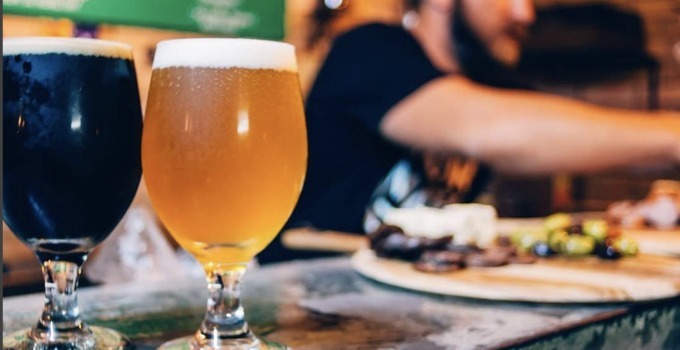 The Sunshine Coast is now home to some of the best bars in the state and we (for research purposes) figured we should knock back some frothy boys and see where the best places for sinking pints are. Already onto its second venue (GROWTH), Village Bicycle is the place to be. Split into three main areas, the front patio, the indoor bar and a pumping beer garden – it’s not surprising that the bar/restaurant is constantly busy. Tuck into Baja fish tacos, Village fried chicken and fresh poutine, washing down all that goodness with rotating craft beers including Young Henrys and Land & Sea Brewing. What are you waiting for? On ya bike! Sleepy Nambour? Not so much anymore! From the Your Mates Brewing crew you’ll find The Basement bar tucked away on Currie Street. With 10 rotating beers on tap, and a fridge full of cold ones you’ll never be bored at Basement. They’ve got stacks of snacks too, chow down on pork belly bites with sticky soy glaze and southern popcorn chicken – or go the whole hog with a pulled pork pizza. Bikes, bites and brews – MOTO could be the most badass place north of Brisbane. With four rotating taps of Sunshine Coast and Queensland regional brews, MOTO is passionate about showcasing the best of micro-breweries from the sunshine state. Pair your bev with a gourmet toasted jaffle with prosciutto, mozzarella, sun dried tomato and Maleny smoked cheese, or get stuck into pulled beef nachos. It’s only just washed up in Noosa but Land & Sea is already making a huge splash with the locals. Using only locally sourced ingredients their love for all things coastal shines through. Their signature beer ‘Coastie Common’ is their taken on a classic lager, and is perfect for those long, hot, coast days. For those that believe fortune favours the bold, we can’t look past the hoppy Proper IPA (6.6% hello!) or the malty, Brown Ale. Grab a local plate with spent grain crustini, beer cheese fondue, serrano ham, olives and pickles and settle in for the afternoon – just don’t forget to grab a growler on your way out. With high ceilings, enormous chandeliers and more timber than you can poke a stick at, you’d be forgiven for forgetting you were on the Sunshine Coast. Not your standard brewery, Copperhead is known for its more interesting beers including a berry saison, a peach wheat beer and a rich, dark chocolate stout. Whether you’re a hard-core beer enthusiast or just looking for a relaxed afternoon with mates order a paddle of Copperheads finest and a platter of pork and chicken terrine, pate, smoked meats, cornichon and flatbread. If you haven’t heard the Brouhaha around Maleny’s best brewery you’ve clearly been living under a rock. Living the highlife in the Sunshine Coast hinterland, the boutique brewery is pouring some cracker bevs. Slurp down something fruity with a strawberry rhubarb sour or raspberry saison, or take a walk on the dark side with the malty, burnt caramel milk stout. We recommend grabbing a tasting paddle, a slow cooked Wagyu pizza and some tasty sides and consider moving there permanently. Hop to it! - the gourmand who grew up on a steady diet of fish’n’chips by the sea.